Siblings give us our first experience of the tyranny of comparison. Birth order programs us for life, and, in childhood, where you fit in is as obvious as your shoe size or those marks on the doorframe…. 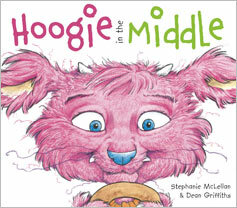 Hoogie in the Middle, by Stephanie McLellan and illustrated by Dean Griffiths, features a family of benevolently hairy monsters who look like a cross between a domestic long-haired cat and one of Sendak’s wild things (the horned one in the striped pullover), resplendent in My Little Pony colours. Pumpkin, the eldest child, is blue like mom. Baby Tweezle is green like Dad, but middle child Hoogie is magenta, like herself. Hoogie feels ignored and neglected, neither as cute as Tweezle, nor as competent as Pumpkin…. This picture book is a terrific example of words and images doing their own job. The text gives us movement (as Pumpkin skips and Tweezle toddles), melody (as Hoogie whispers, ‘Too big. Too small. No room for me at all’), and, most of all, metaphor (‘Sometimes Hoogie feels like the hole in the middle of a donut’). This loveable family comes alive with Dean Griffiths cuddly personified monsters. Vibrating hues painted in pencil crayons and watercolours evoke an expressionistic style with realistic elements. The clever use of negative space adds dimension and energy to the characters as well. Consistent rendering makes switching from each book in the series a seamless transition. The difference is the focus on the title characters, e.g. Hoogie holding a donut over one eye exaggerating the fact that she feels ‘like the hole in the middle of the donut’ or Tweezle holding a large beach ball reinforcing his babyish stature. “Stephanie McLellan, who has received numerous awards and nominations for her previous books, has created a charming text…Dean Griffiths, the prolific and popular award-winning illustrator of over twenty-five picture books, has provided readers with flamboyant full-page depictions of purple, green and blue monsters. The vigor and color are compelling, but it is the details that fascinate. Facial expressions and body language capture the confidence and joie-de-vivre of Pumpkin, the cuteness of Tweezle, and the angst of Hoogie. Both the humor and perceptiveness are endearing. Hoogie in the Middle would make a great read-aloud for children aged three-seven, either in a group or individually. Middle siblings and monster lovers are among those who will especially relate to Hoogie.